PURCHASE - The part of the bit above the mouthpiece. With a short purchase, the bit will act quicker in a horse's mouth when the rider pulls on the reins. With a long purchase, the bit is slower to react. SHANK - The part of the bit below the mouthpiece. Will give you leverage on the mouthpiece. The shorter the shank, the less control - the longer the shank the more control. CHEEKS - The sides of the bit. Includes both the purchase and shank. MOUTHPIECE - The part of the bit that goes in the horse's mouth. Jointed Mouthpieces, also called broken mouthpieces, have a single joint in the center of the bit. Pressure is applied up and out to the top and front of the mouth. When the mouthpiece is pulled, it creates a V shape, applying pressure to the horse's tongue, lips, and bars. 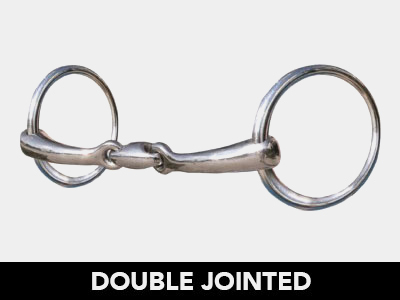 Three-Piece Snaffle Mouthpieces, also called double jointed bits, create more of a U shape instead of a V, making it a more gentle mouthpiece than the single jointed. This mouthpiece applies pressure to the lips, tongue, and bars of the mouth. 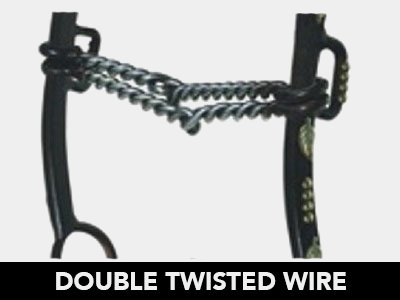 Double Twisted Wire Snaffle Mouthpieces are made up of two single jointed strands which are broken off-center of each other. Two strands amplify pressure on the bars of the horse. These bits are considered very severe. 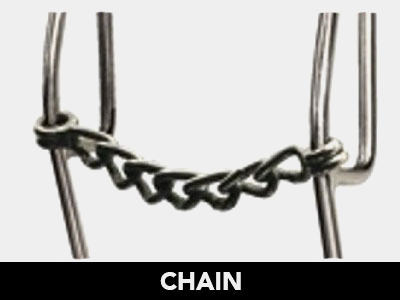 Chain Mouthpieces do not work on the bars like a snaffle bit, but on the corners of the mouth. Chain mouthpieces should be made of high quality link chain, not bicycle chain, which is too severe. 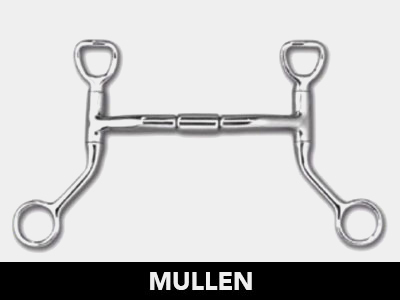 Mullen Mouthpieces have a gentle outward curve to the mouthpiece, giving even pressure and allowing the tongue more room. They place pressure on the tongue, lips, and bars. It does not have as much tongue relief as a ported bit, but is still considered a mild bit in experienced hands. 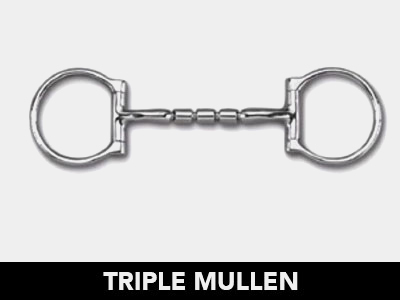 Triple Barrel Mullen Mouthpieces are the flexible and forgiving when relaxed, solid with tongue pressure when engaged. Ported Mouthpieces have a curve to the mouthpiece, which may be low or high, narrow or wide. Ported bits put pressure on lips, tongue, roof of the mouth, and bars. Lower ports are similar to mullen mouthpieces; higher ports will press on the roof of the mouth. A wider port will offer more tongue relief. Swivel Mouthpieces swivel on the shank. Allows independent shank action. Gives the mouthpiece a different action than a solid constructed bit. Causes a horse's mouth to salivate which allows the mouth to stay soft and usable to the rider. It is intended to rust. It actually does have a sweet taste to it as rusting occurs. Gives a clean, neat look to any mouthpiece. Does not encourage or discourage salivation. Many riders, tack shops, and even manufacturers confuse bit terms. 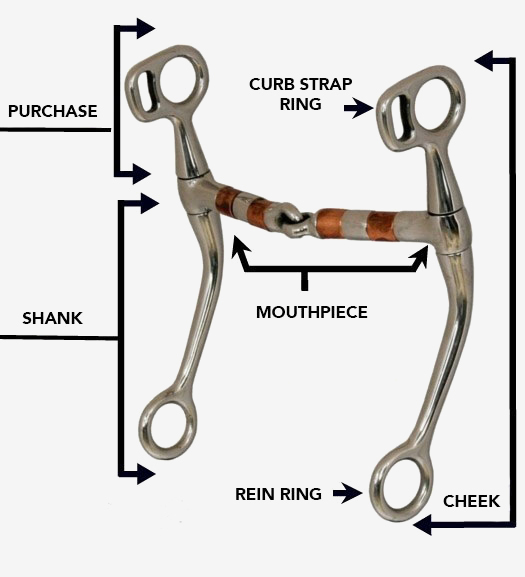 Snaffle bits are those that do not have purchase rings to connect to the headstall. 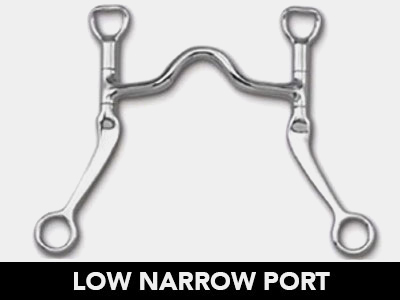 A snaffle's rings put pressure on the sides of the horse's mouth while the mouthpiece, which is usually a broken design, puts pressure on the horse's mouth. Because of the lack of shanks, the snaffle bit is a more gentle bit if used properly. Shanks on a bit multiply the pressure that the rider puts on the reins. 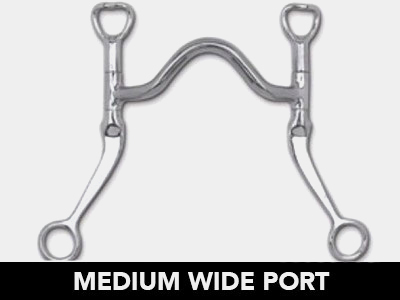 Without shanks, the snaffle bit delivers the exact amount of pressure the rider uses. Curb bits, including the pelham and Weymouth, are leverage bits which multiply the pressure put on the reins; the longer the shank, the more severe the pressure. 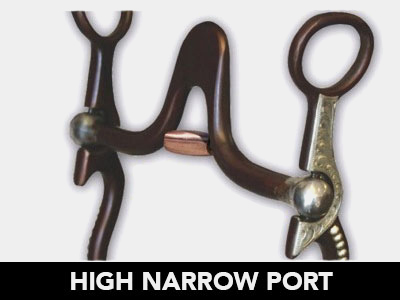 The bit can put pressure on the horse's bars, tongue, and roof of the mouth with the mouthpiece, and also put pressure on the poll and chin groove. The type of pressure each bit produces is dependent on not only the length of the shank, but also what type of mouthpiece is used in the bit, as well as where the bit is fitted into the mouth of the horse. Exactly how severe a bit feels to a horse is determined by several factors. 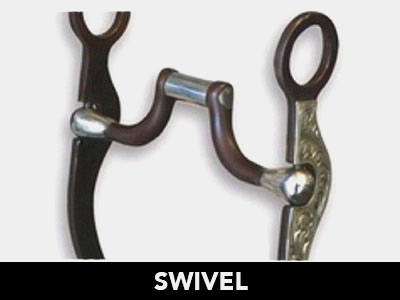 Though Snaffle bits have been coined the "more gentle" bit, an ill-fitting Snaffle or an inconsiderate rider can still pain a horse. The longer the shanks of a bit, the more potential for pressure. Where the bit is placed in the horse's mouth also affects the feel: the further down in the mouth, the more concentrated the pressure. The mouthpiece of the bit is also a major factor in determining how effective (and on the other hand, harmful) a bit can be. 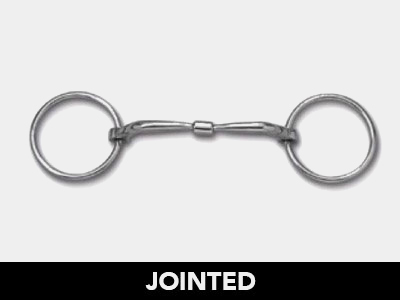 Both curb and snaffle bits can be purchased with jointed mouthpieces (the jointed mouthpiece that is often incorrectly labeled as a "snaffle"). Jointed mouthpieces, whether on a bit with or without shanks, can increase the pressure capabilities of a bit. However, with these things in mind, it's important to note that experienced riders can use many types of bits with great success and gentleness with their horses. Inexperienced or heartless riders can do the exact opposite. The feel of the bit - Not only what the horse feels when the rider pulls on the reins; but, also what the rider feels. For example, suppleness or stiffness. Timing - The amount of time required from the point when the reins are pulled until the bit has done as much as it can do.